With C++17 we get another facility to handle the conversion between text and numbers. Why should we care about the new routines? Are they better in any way? 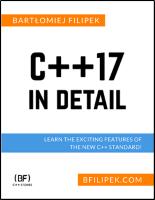 And with C++17 you get another option: std::from_chars! Wasn’t the old stuff good enough? Why do we need new methods? In short: because from_chars is low-level, and offers the best possible performance. The API might not be the most friendly to use, but it’s easy enough to wrap it into some facade. There are still some missing elements in the floating point implementation for to_chars, see this extensive comment at r/cpp from Stephan T. Lavavej to know more. 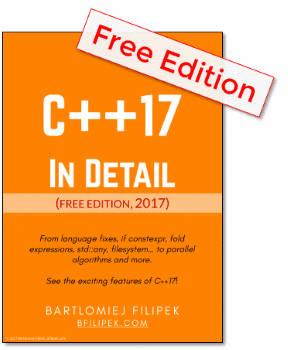 How to Convert a String to an int in C++ and How to *Efficiently* Convert a String to an int in C++ written by JFT. Let’s have a look at the API now. std::from_chars is a set of overloaded functions: for integral types and floating point types. Where TYPE expands to all available signed and unsigned integer types and char. base can be a number ranging from 2 to 36. FLOAT_TYPE expands to float, double or long double. chars_format is an enum with the following values: scientific, fixed, hex and general (which is a composition of fixed and scientific). from_chars_result holds valuable information about the conversion process. Success ptr points at the first character not matching the pattern, or has the value equal to last if all characters match and ec is value-initialized. Invalid conversion ptr equals first and ec equals std::errc::invalid_argument. value is unmodified. Out of range The number it too large to fit into the value type. ec equals std::errc::result_out_of_range and ptr points at the first character not matching the pattern. value is unmodified. Here are two examples of how to convert a string into a number using from_chars, to int andfloat. std::cout << "out of range! res.ptr distance: "
The example is straightforward, it passes a string str into from_chars and then displays the result with additional information if possible. Does "12345678901234" fit into the number? Or you see some errors from the conversion API? The general format is a combination of fixed and scientific so it handles regular floating point string with the additional support for e+num syntax. I did some benchmark, and the new routines are blazing fast! On GCC it’s ~4,5x faster than stoi, 2,2x faster than atoi and almost 50x faster than istringstream. On Clang it’s ~3,5x faster than stoi, 2.7x faster than atoi and 60x faster than istringstream! The whole benchmark might be however a story for another post, so I’m not sharing the code yet. If you want to convert text into a number and you don’t need any extra stuff like locale support then std::from_chars might be the best choice. It offers great performance, and what’s more, you’ll get a lot of information about the conversion process (for example how much characters were scanned). The routines might be especially handy with parsing JSON files, 3d textual model representation (like OBJ file formats), etc. Have you played with the new conversion routines? What do you usually use to convert text into numbers?